You know the sounds of ATL, LA, HOUSTON, and the CHI, but who has the sound of Sin City? We are extremely excited to discover the Las Vegas super star. Is it YOU? BRING YOUR “A GAME” PERFORMANCE! This WILL be filmed for a reality show on the discovery and building of the Sound of Las Vegas show winner. You will be required to sign a filming release to audition on camera and be considered for the grand prize which includes: a recording contract with Mogul Money Records, album production with award winning songwriters and producers, artist development with a celebrity star maker, premium music video production, full spread in Black Moguls Magazine, feature spot and music rotation on Black Moguls weekly radio show live from Las Vegas, a feature performance at one of the hottest clubs on the Las Vegas Strip, a CA$H prize, AND MORE! 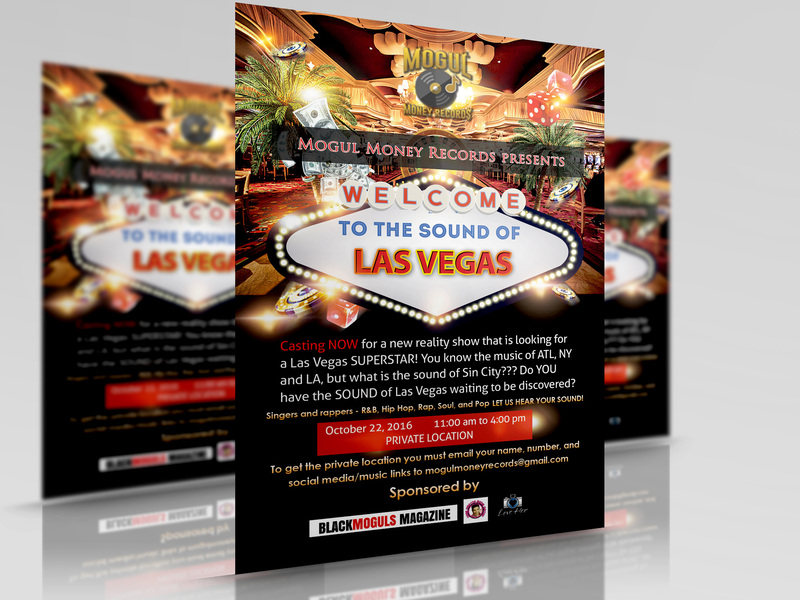 This is just the beginning…you don’t want to miss your shot to be THE SOUND of Las Vegas! What to wear: Dress to impress! Look like a superstar artist! What to bring: Music to perform to. Should be on CD or jump drive in mp3 format. We will have microphones and plug ins for instruments if needed. To get a VIP time reservation and skip the line, email EPK/photos, links to social media, and links to your music and/or videos to mogulmoneyrecords@gmail.com.